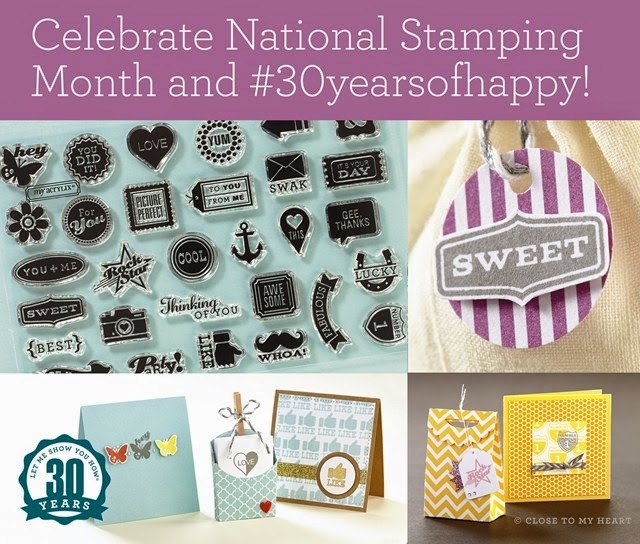 Creative Inspirations : National Stamping Month "30 Years of Happy"
September is National Stamping Month, and Close To My Heart is ready to celebrate all month long! When you spend $30 on any current retail-priced stamps during the month of September, you qualify to receive the exclusive C-sized stamp set #30yearsofhappy for FREE! This special offer is part of our celebration of National Stamping Month and in honour of our ongoing celebration of our founder and CEO Jeanette Lynton’s 30-year anniversary in the scrapbooking and stamping industry. The exclusive stamp set features 30 mini images and sentiments perfectly suited for 30 days of happy stamping! These stamps would be great for so many different projects.